In the Android world we are spoiled for choice. From Motorola, to Honor, OnePlus, Nokia, HTC and LG, all these manufacturers are preparing new smartphones. To give you an overview and to stop you from making any rash purchases, we’ll tell you everything you need to know about the smartphone highlights for the upcoming weeks. It isn’t official yet, but according to an invitation Motorola will hold an event on April 19, 2018 in São Paolo, Brazil. Since the Moto G6/G6 Play weren’t presented at the Mobile World Congress in Barcelona, it seems logical that Motorola will use the event in April to present the new G6 series. The Chinese brand Honor is working hard to launch its successor to the Honor 9. As per usual, the device will first be presented in China on April 19th. The international launch date will likely be May 15th, since Honor sent an invitation to us for this date a few days ago. With the Honor 10, Honor of course wants to build upon the success of the Honor 9, and at the same time try to make the OnePlus 6 seem unattractive. It remains to be seen whether they’ll succeed. On our overview page you can read what we already know about the Honor 10 in terms of its technical specifications, design and the possible retail price. HMD Global announced a real onslaught of new smartphones at the Mobile World Congress 2018. This set of devices will be equipped with Android One when they hit the American market. First it will be the Nokia 1, Nokia 6 (2018), and the Nokia 7 Plus, and then the Nokia 8 Sirocco shortly thereafter in April 2018. The OnePlus 5T has been sold out for a few days and it isn’t expect that OnePlus will order another batch. After all, the leakers on Twitter and the two founders of OnePlus themselves have been whistling from the rooftops for weeks that the OnePlus 6 will be coming soon. The word is that the OnePlus 6 will come with a notch in the display, and Pete Lau had to intervene and promise the angry community that the notch can be disabled through an option in the software. This option will only be made available later through a software update. So when sales start in May, OnePlus fans may have to get accustomed to the notch. LG has had a restless year in 2018. There was a change at the head of the mobile division that affected the LG G7. Hwang Jeong-hwan, who took over as head of LG Mobile on November 30, 2017, decided that the G7 shouldn’t be presented at the Mobile World Congress 2018. Allegedly, there weren’t enough unique selling points in the G7 at the time. Instead, LG sent the V30S ThinQ to the MWC. The ‘ThinQ’ suffix, which LG uses for networked products equipped with artificial intelligence, will also be added onto the G7 in the future. On May 2nd, the LG G7 ThinQ will be presented to smartphone fans simultaneously in New York and Seoul. Here you will find all the information and impressions about the launch. But the extensive leaks already show that the LG with the new G7 could cause a surprise. If you’re interested in the G7, take a look at the extensive overview page of the upcoming top smartphone from LG. A surprise from Taiwan could be on its way in May, as HTC is rumored to be preparing a successor to the U11 series. 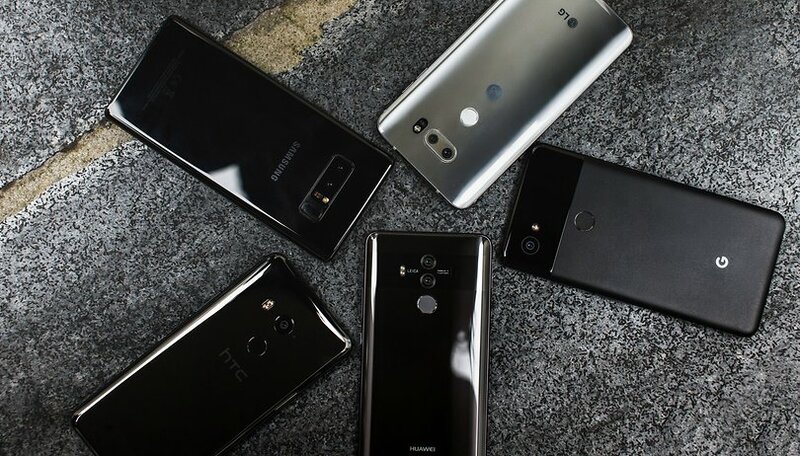 It’s still unclear whether there will be a pair of successors to the U11 and U11+, or alternatively, if they will release a single top smartphone for number 12. The remaining days in April and the month of May will be filled with exciting smartphone launches. Do you already know which of the smartphone highlights listed here is most interesting to you? Let us know in the comments! All these new launches are very exciting. I'm dying to see how all these notched phones are gonna pan out. The funny part is all these OEM'S have decided to clone the Apple X. Then Apple has already stated their dropping it. My question, are the notches really necessarily needed? I have not used a notched phone so I really can't say if I like it or not. But somehow I think it takes away from the viewing pleasure!